BBC News - Why was it cold in the UK, but not across the world? Why was it cold in the UK, but not across the world? January was rather cold in the UK. But across the whole of the world, January was warmer than usual. Why? 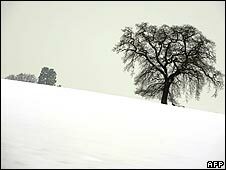 According to provisional figures from the Met Office, the Britain's national weather service, January 2010 was the eighth coldest on record for the UK - the worst since 1987. A swath of northern Europe and parts of the US also experienced unseasonably cold temperatures. And yet, explains Met Office research scientist David Parker, many areas, including large parts of South America, Africa, Asia, and Canada, had a warmer January than usual. It's all an issue of different patterns affecting the weather. In the UK's case, the culprit is wind. "It boils down entirely to which way the wind blows, especially for the first half of the month," says Mr Parker. "The winds blew from the north and north east, created an area of coldness, which covered Europe and a lot of Siberia, relative to normal." The prevailing winds for the UK, even in winter, are from the warmer south and south west, and a change in direction is often the culprit for bad winters. In 1963, the wind was almost persistently from the north east, says Mr Parker. Dr John Methven of Reading University's department of meteorology says troughs in the Jet Stream - the fast-flowing current of air in the atmosphere - are to blame for a cold start to January in the populated areas of the northern hemisphere. "There was a trough over western Europe, China and the east Coast of North America. "The Jet Stream undulates north and south. [This year] the Jet Stream was further south than usual. That puts us in the polar air mass." This "negative Arctic oscillation" is a short-lived phenomenon, says Gavin Schmidt, a climate scientist at Nasa's Goddard Institute for Space Studies. It can last 10 days and then pass, but the current weather pattern affecting the UK lasted from mid December to mid-January. The warmness affecting the rest of the world is less of a short-term effect. Weather experts look for anomalies in temperatures. For instance, was January 2010 hotter than the January average between 1960-1990? The final Nasa analysis for January's temperature is not available but it could show a global average temperature that is higher than usual. It has been established that 2009 was the second warmest in the global record and the warmest ever in the southern hemisphere record. In total, average global temperatures have increased by about 0.8°C (1.5°F) since 1880 [according to Nasa GISS figures], but temperature anomalies for individual regions and seasons can be much larger, both warmer and colder. "It is conceivable January will come out very warm," says Dr Schmidt. "The reason why it was warm is mainly because of the El Nino in the Pacific chugging along for about three or four months." El Nino, which happens every few years, sees a warming of the waters of the equatorial Pacific Ocean, and has far-reaching impacts on the weather worldwide. "It is a kind of Tango dance by the ocean and the winds," says Mr Parker. Unlike a more localised effect like troughs in the Jet Stream, El Nino has a lag of a few months before its effects are fully felt, says Dr Schmidt. So the world can expect warm weather for another couple of months at least. Figures from analysis by climatologist and sceptic Roy Spencer suggest that sea surface daily global average temperatures in January were hotter than 2003-2009. Looking over the data for January in the southern hemisphere, Dr Methven says only South Africa comes out looking unusually hot. The El Nino effect is not a particularly dramatic one this year, he suggests. Very often the exact explanations for short-term changes in weather patterns are not easily ascertainable. There's an element of chaos theory, suggests Mr Parker. "When somebody starts a game of snooker and sends down the white [it's unclear what will happen]. A very minute difference in the way the first ball is spinning could make a big difference at the end."